Leaders will have to develop the formula for what combination of activators works best for them. Every worksite is unique, and every work group responds differently to these motivational concepts. Photo courtesy of Leadpoint. Engineering Controls. Can we engineer or design the problem away? For example, if there is a fall hazard associated with performing a maintenance function, can we install a work platform to eliminate the risk of falling? Brian Haney is Vice President, Safety and Compliance, at Leadpoint (Phoenix, AZ), the expert in providing operational support and execution to MRF operators across the country. Brian brings more than 20 years of environmental, health and safety practice to his role at Leadpoint. 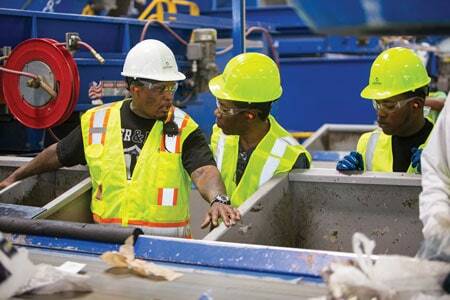 For the last 15 years, he has focused exclusively on safety and environmental leadership in the recycling industry. Prior to that, Brian worked in safety and compliance roles for a Fortune 500 waste and recycling company, an international chemical distributor and as a consultant. He is a member of the ANSI Z245 Standards Committee for the Waste and Recycling Industry. Brian is also a member of the NWRA where he is a member of the Safety Committee and SWANA where he helped develop the “5 to Stay Alive” program for MRFs. A respected expert and industry speaker, Brian has presented at SWANApalooza 2017 and works to improve safety throughout the recycling industry. Brian can be reached at brian.haney@leadpointusa.com or visit www.leadpointusa.com.